ALICIA KEYS & SWIZZ BEATZ -- NO Problem Making Out Next To Ex-Wife Mashonda....On St. Barts Family Vacay! If it works for Kimora, her men Djimon & Tim, Russell Simmons and all the kids....it can also work for Swizz Beatz and his blended family. Alicia Keys, her husband Swizz, and their kids Egypt and Kasseem are all on family vacay in St. Barts....with Swizz's ex-wife Mashonda Tifrere. The Deans took a page out of the Simmons' annual St. Barts vacay book and made the trip they are curently on a bundle of big blended family fun. Alicia & Swizz were spotted at Nikki Beach in St. Barts today sneaking a mini-makeout session on the beach beds while the kiddies played in the sand. 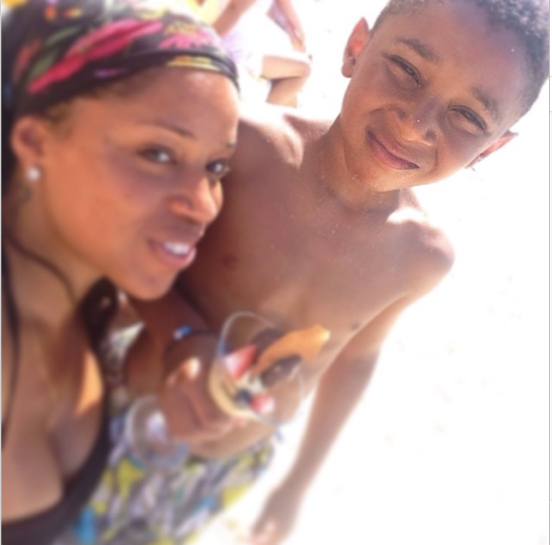 But also on that beach bed...was Swizzy's ex-wife Mashonda! Hey, Alicia is his wife now....so it's to be expected, right? Alicia put her curvy bikini body on display in a neon orange bandaeu top and matching bottoms while chasing little Egypt on the beach. And Papa Swizz took off his shirt to hop into the ocean with his youngest. Alicia, who is currently working with Pharrell on her new album, and Swizzy were also spotted having some fun while the Mr. gave his Mrs. a lift to their car. As for the fine family fun, handstands for everyone!